The Magic School Bus: Inside the Earth. 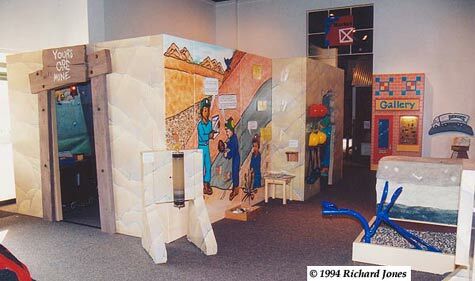 From the autumn of 1993 until January 1995 I worked as the Workshop Manager for the Children's Museum of Houston. 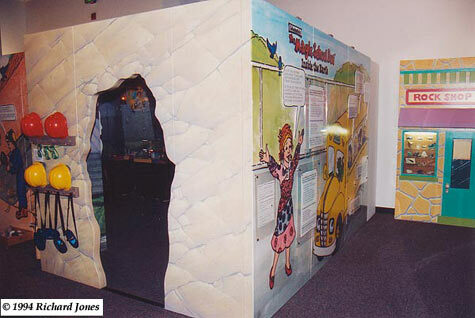 Apart from ongoing general exhibit building, maintenance and repair, my primary role was supervision of the construction of a large part of The Magic School Bus, Inside the Earth travelling exhibition. Subcontractors made many of the parts, but all the wooden parts, some of the electrical items, and some of the metalwork were fabricated in the museum workshop. 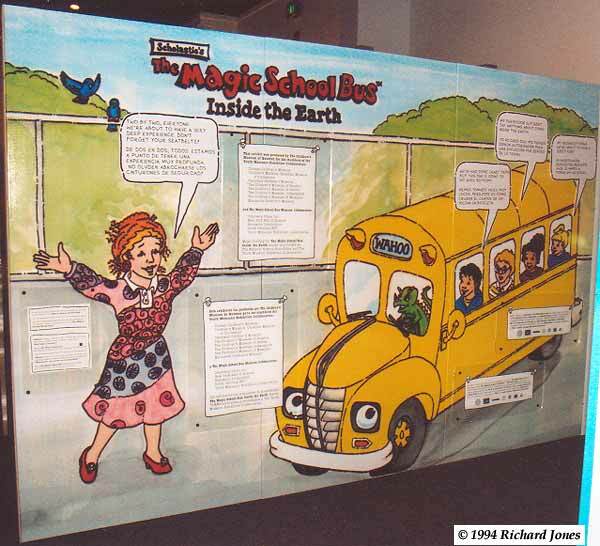 The Magic School Bus is a series of educational books, television programmes and exhibitions aimed at children under the age of approximately ten. The Magic School Bus and its passengers take off on various educational adventures. Photo 2. The exhibition construction was complex and the assembled parts were large requiring additional rented storage for there was not room at the museum workshop for the mass of items created. This picture shows a view from one end of the gallery. 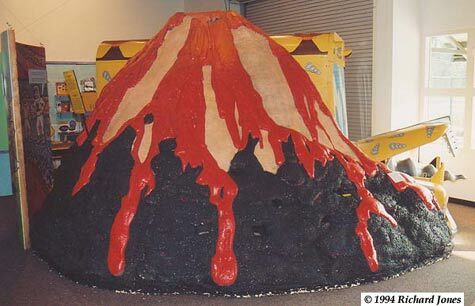 The display was meant to be both fun and educational for young children with geology as the theme. Characters from the books and television series were represented on vinyl panels. 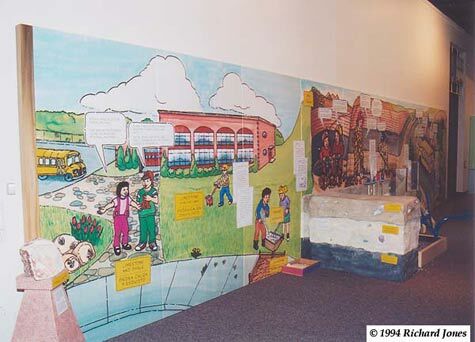 Strategically placed speech bubbles in English and Spanish guided visitors towards the purpose of the displays and the activities nearby. Additional labelling provided more information as required. Photo 3. This view from the opposite end of the gallery looks back to the position from which photo 2 was taken. To the left of the picture you see the L shaped Mine with an entrance at either end of the L.
Photo 4. Taken from approximately the same position as photo 2 above, but captured after turning clockwise by about 90°. The rough hewn entrance to the Mine at the end of the short leg of the L is visible in the left foreground. In the right background is the 'Rock Shop', with its display of semi-precious stones. Photo 5. A couple of paces inside the mine after entering via the entrance at the end of the short leg of the L. Overhead rough 'beams' support the 'roof' and on the right rails and ore carts. The top of each cart held a range of interactive displays that included various rocks, scopes, etc. Recesses in the wall to the left displayed precious or semi-precious stones and rocks; these became visible using black lights and were identified using written clues and charts. 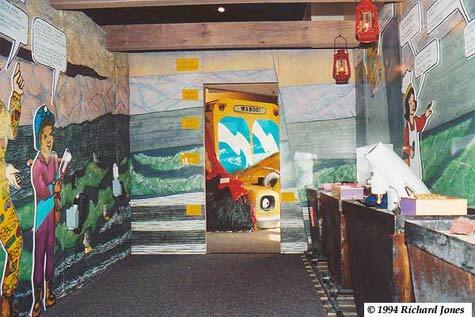 In the background, through the square entrance to the Mine, is the Magic School Bus itself. Photo 6. The yellow Magic School Bus sat just outside the rectangular mine entrance. 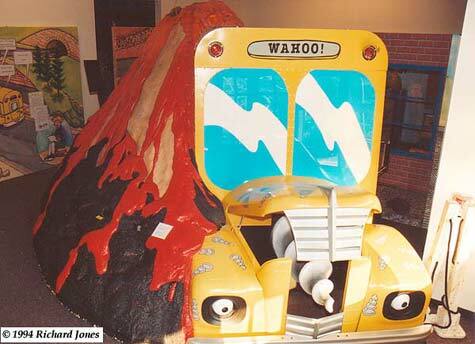 The bus had come to rest in the middle of a volcano after its journey into the centre of the earth. The flanks of the volcano had several voids in which were placed rocks and other geological samples for children to find. The holes remained dark until a hand explored inside the crevice; this caused a light to come on revealing the hidden rock or object. Photo 7. The bus could magically bore into the centre of the earth with a drill bit that protruded from the front. Some children, especially very young ones, seemed to have more fun climbing and clambering over the corkscrew like drill sticking out of the engine compartment than with any other part of the exhibit. Behind the bus, just visible in the right background, is one of the walls of the Classroom. Photo 8. 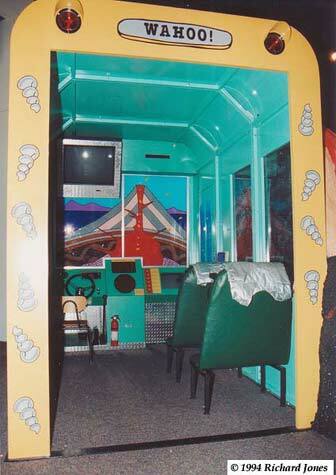 The Classroom was situated behind the bus. 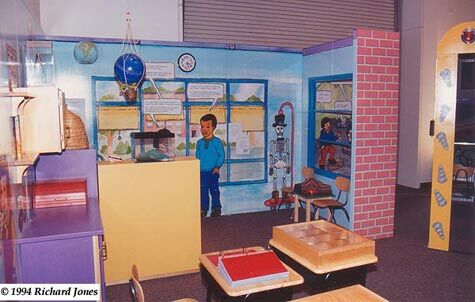 Hidden from this angle, but behind the yellow and purple cabinets, are a teacher's desk, desks for children, and chairs on which were placed various learning aids. Photo 9. A view into the back of the bus. To the right, windows protected video disk players and televisions set up inside the Volcano-- they showed videos of various volcanic activities. Children sat at the driver’s seat, and 'drove' the bus into the earth by pulling levers and using their feet on the pedals. They could view their progress on the monitors above and to the right, and the volcano on the windscreen would 'erupt' at appropriate moments.